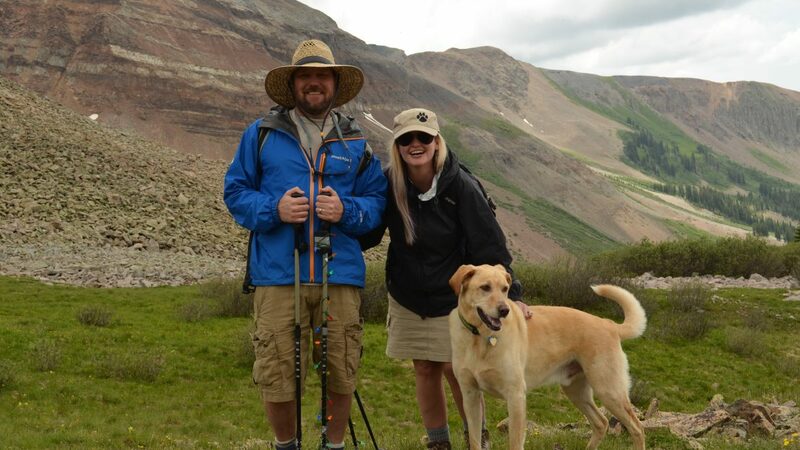 When Jen Reeder’s husband Bryan, then 39, needed a kidney transplant due to an autoimmune disease called IgA Nephropathy, she worried he might get sicker while he waited on the transplant list. The National Kidney Foundation reports that 13 people die every day while waiting for a kidney transplant. So, Reeder offered him one of hers. Well-meaning friends and relatives worried how live kidney donation would impact the 39-year-old writer’s health and well-being. Would she have to give up skiing? Could she still drink alcohol? Would it shorten her life? Reeder pushed aside their fears (which proved unfounded) and continued with a battery of medical tests before undergoing in the procedure in July, 2012. The health risks of live kidney donation are minimal. 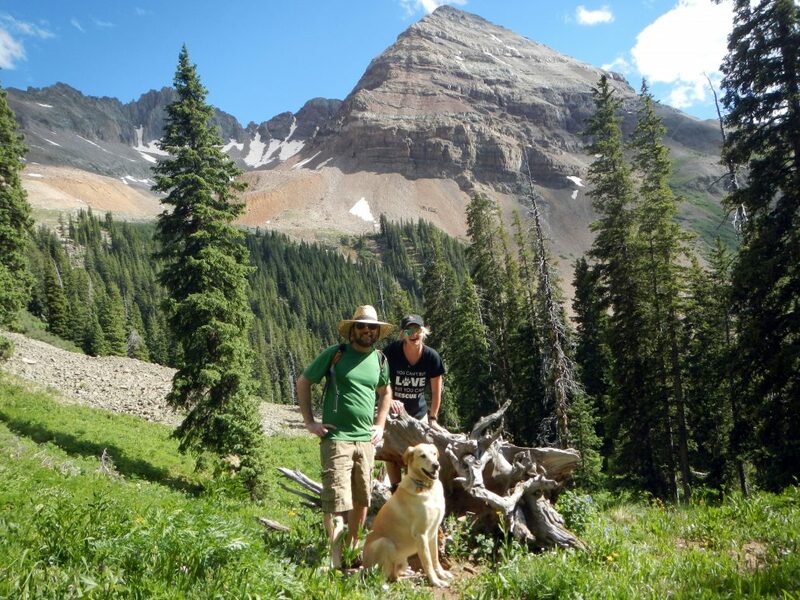 After the couple recovered and returned to favorite outdoor activities, Reeder founded a nonprofit called Rock 1 Kidney that aims to share the stories of live kidney donors to assuage common fears. The website features stories of donors from all walks of life, including those who donated to parents, siblings, even complete strangers and went on to live active, full lives. Soon-to-be published research out of UCLA Health shows that the health risks of live kidney donation are minimal. The median risk of failure in the remaining kidney was one case per 10,000 five years after donation and 34 per 10,000 20 years later. In fact, a father who donated a kidney to his daughter 50 years ago is still thriving, as is the daughter who received his kidney. Folks talked to Reeder about being a live kidney donor and raising awareness about life kidney donation. The following excerpts have been edited for clarity and brevity. 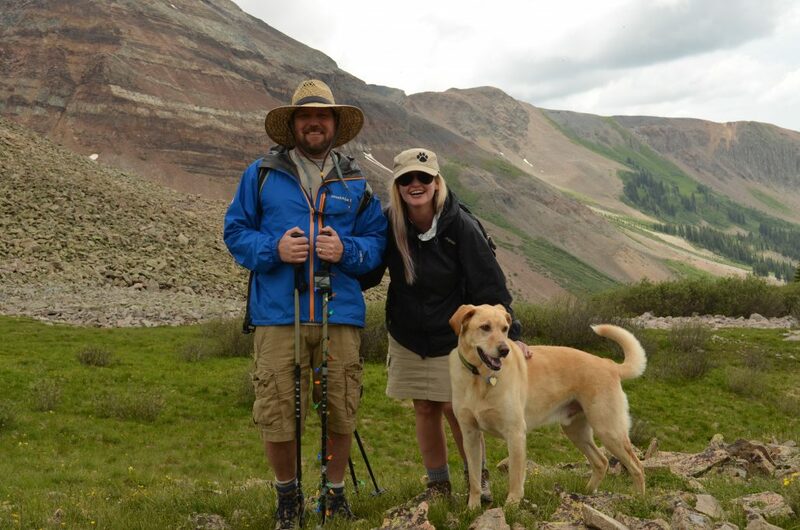 Jen Reeder and her husband Bryan Frkylund hiking in Colorado. Photo by Tom Reeder. Tell us how you came to donate a kidney to your husband. We were living on the big island of Hawaii, and he had some swelling in his neck. We went in to have it checked out thinking maybe it was dehydration, but they ran labs and uncovered that he maybe needed a kidney biopsy. A kidney biopsy revealed that he had an autoimmune disease called IgA Nephropathy where confused antibodies attack your kidneys until they fail. There’s no cure. The only nephrologist on the Big Island wanted to stick a chemo drip in his arm for two years, so we got a second opinion on the main land. Through medication, he went into remission for about five years. But then, his kidney function started plummeting again. I’m O-negative, the universal blood donor, so I could give anyone a kidney with O-negative blood as long as I passed all the tests to show I wouldn’t die on the operating table. if somebody gets cancer, there’s not a lot you can do other than walking their dogs and bringing them meals or driving them chemo or whatever. But when someone needs a kidney, it’s really empowering, because most of us are born with two, and we only need one. What is the recovery like for a live kidney donor? I’m not going to lie, it’s pretty painful initially, but they give you lots of nice painkillers. I had probably about nine days of intense pain. I was hunched over like a question mark. But you just take a lot of naps. The main thing is just waiting for the anesthesia to leave your system. I think by the sixth week we were hiking and camping and back to normal. It’s a small price to pay for saving someone’s life, especially when it’s the love of your life. And it’s really rewarding to see. It’s weird because the kidney donor goes in feeling great, and you wake up feeling like you had an operation. He went in feeling crummy. As your kidney function declines, you start having fatigue and less energy, and he had been retaining water. He lost about 16 pounds of water weight within a week or two. The recipient wakes up feeling like, “Whoo-hoo! I got a bionic organ.” But I was only in the hospital for two nights. Brian was only in the hospital for three nights. It’s pretty amazing what modern medicine can do. What are some of the biggest misconceptions around live kidney donation? The big one is, you won’t live as long. There are actually studies show kidney donors statistically live longer than the general population. The theory is that if you’re healthy enough to donate a kid, you’re probably healthier than the general population. There’s another misconception I’ve heard: “Well, I’m over 65, so I can’t donate.” That’s not true either. I’ve heard of people in their sixties and seventies who have donated kidneys. One guy in New Zealand in his early sixties donated a kidney just to whoever needed it most, and then went on to hike the Camino de Santiago across Spain for 30 days. You can still live a healthy, happy, fulfilled life with one kidney. 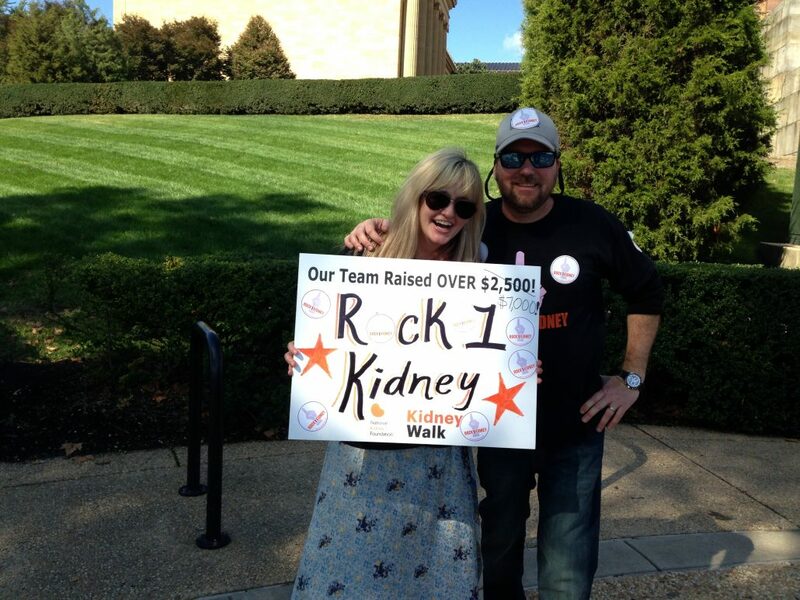 That’s the point of Rock 1 Kidney. Representing the cause at the 2014 Philadelphia Kidney Walk. What do you hope to accomplish with your nonprofit? What really has been striking, is just how diverse kidney donors are. I’ve had people from every age, walk of life, financial situation, different countries. One woman who was 47 heard of a friend’s 18-year-old sister who needed a kidney, so she donated to her. Social media’s been an interesting way of connecting potential donors with people in need. It really makes you feel connected because the only common thread between a lot of people is that they donated a kidney. I’ve had people who are Christian, who are Jewish, who are Atheist, who are Buddhist share stories. It really makes you feel connected because the only common thread between a lot of people is that they donated a kidney. It just restores your faith in humanity and the power of courage and altruism. Another cool thing is paired exchange. Sometimes people will just donate to a stranger, and it starts a kidney chain. If I was going to donate for my husband but I wasn’t compatible, blood type-wise, then he could say, “Jen’s going to donate a kidney on my behalf,” and hospitals will match you up with someone else with the blood type. 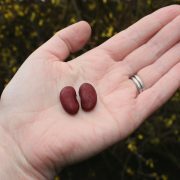 What advice would you have for someone considering live kidney donation? Definitely make preparations to take some time off work. There are organizations that provide grants to kidney donors to help cover time off of work, or transportation costs, or hotel stays, things like that. The best advice that I got before I donated a kidney was to not watch any funny movies with Jim Carrey or Steve Carell, because after you’ve had abdominal surgery, it hurts to tense your stomach muscles. I actually had to hang up on my brother. He’s really funny, and he got on a tear and I was laughing and trying to push a pillow into my stomach to keep it from hurting. I had to give up and hang up on him. That’s a good problem to have. Donating a kidney can be incredibly rewarding. Like any surgery, there can be risks. So definitely check with a doctor and a transplant team to make sure that it’s right. But if you’re considering donating a kidney, get the facts and don’t be dissuaded by misconceptions or fear.